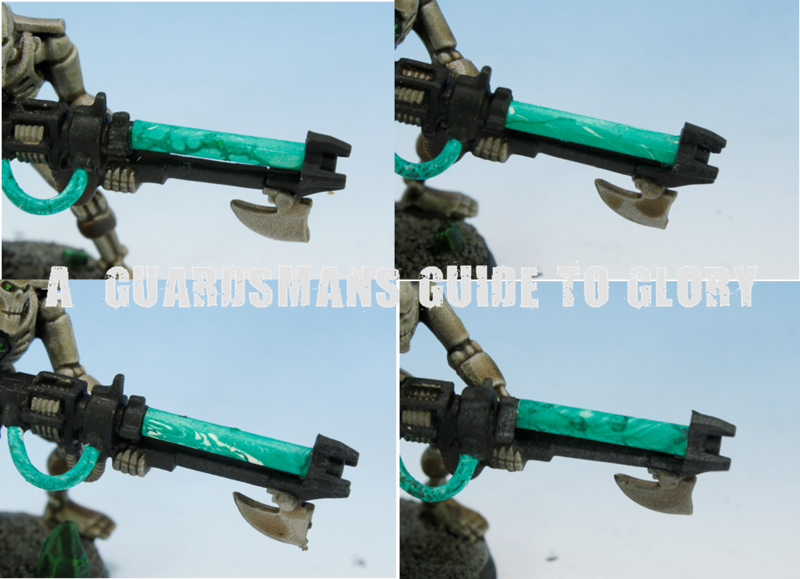 The back problems I mentioned in the last post have really been hampering my attempts to crack on with the Necrons. 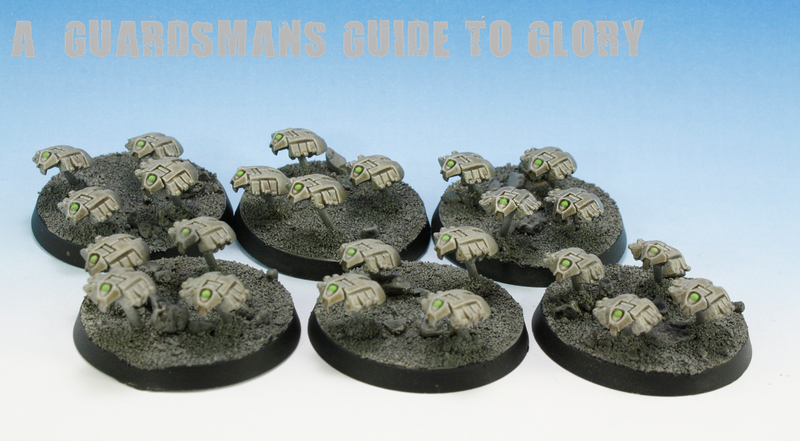 Some progress has been made though; a Warrior Squad and 6 Scarab Bases. The next 12 Warriors. I forgot to wash the resin bases before painting, which has lead to the paint not sticking properly around the edges of the base. Now they're varnished, i'll try paiinting them again and see if it sticks!! 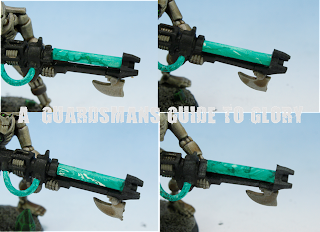 Here are some pictures of the Gauss Blaster rods. I used the marble paint again, and had much better results! There's defiinately a knack to it. Only one out of the 12 wasn't quite as i wanted it. Below are some of the rods from this batch. Finally, the army list. I've never been that great at writting lists, but always managed to get a decent one together in the end. The Necrons have made list writting a real pain in the arse though! I usually make a 'take on all comers' list, or at least something close to it! I just can't seem to get that here. The army list feels very...modular to me, if that makes any sense!! Each section seems to have to compliment the other, and the player needs to have a firm idea of the strategy he or she is going to use. The list is pretty self explanatory for most part. I don't see a lot of Doomsday Arks in the 'Net lists, but i think that S9 AP2 gun is underrated (and i LOVE the model!). I'll probably sit one of these in each corner of my deployment zone and blast away for as long as possible. Yes they'll be vunerable to Deep Strikers and Infiltrators - but isn't everything...? The Warriors and Ghost Arks will be securing and babysitting objectives, supported by attached Crypteks. The 'Arks will provide fire support and spare Warriors as nessesary. The 5/10 strong Immortals (i'll decide on the day how large the squad will be) and the attached Overlord will be providing my mobile support in the Night Scythe, going where they are needed most. The Overlord is excessivly tooled up, simply because i had the points to burn. I was going to spend those points on Scarabs, but i'll try a few playtests first. Finally the Monolith. 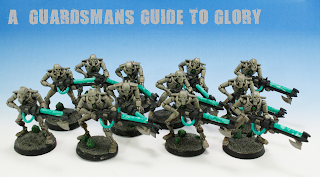 Again, these guys seem to get a bad rep' in this Necron incarnation. Having not played Necrons before, i guess i don't feel that effect as acutely as others, but theyre still a AV 14/14/14 tank with a load of guns which can put pressure on multiple units each shooting phase. His main role will be Fire Magnet and moving units around the field with his Portal, as well as Fire Support. I'm sure this list will change as games progress and new models are released. I love the looks of the 'Stalkers, and think their Twin Linked-confering abillity will prove invaluble so im sure they'll make an appearance. We'll see how it goes. For the time being, i'd love to hear peoples thoughts on the list! Very cool - man, I love that marble effect! Goon on ya for steering clear of the silver and green, I really, really like how they turned out. Sorry to hear you're still at -1 initiative, hope the back feels better soon! Looking good! Hope your health is back to full effect soon! Still curious what type of Marble paint you use? I noticed you have four scarabs per base. I don't know if this is kosher, but for my scarabs I am only doing three per base in order to represent the correct number of wounds, and make the scarabs fill more bases. It doensn't matter if you've got 4 of 10 Scarabs on the base, its still only got 3 wounds.